The Pomegranate has been the symbol of plenty since ancient times. Persephone was the Greek goddess of the Underworld. demonstrate the fertility of the "promised land". 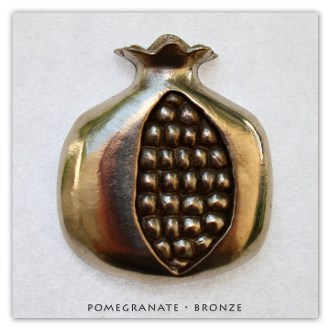 Pomegranate is available in solid: Bronze (Yellow), Sterling Silver (925 De-Oxidized), 14k Gold (Yellow) and 18k Gold (Yellow).